The ‘Sydney Sailmakers’ NSW 12 skiff championships was the most hotly contested 12ft Skiff championship in recent history. 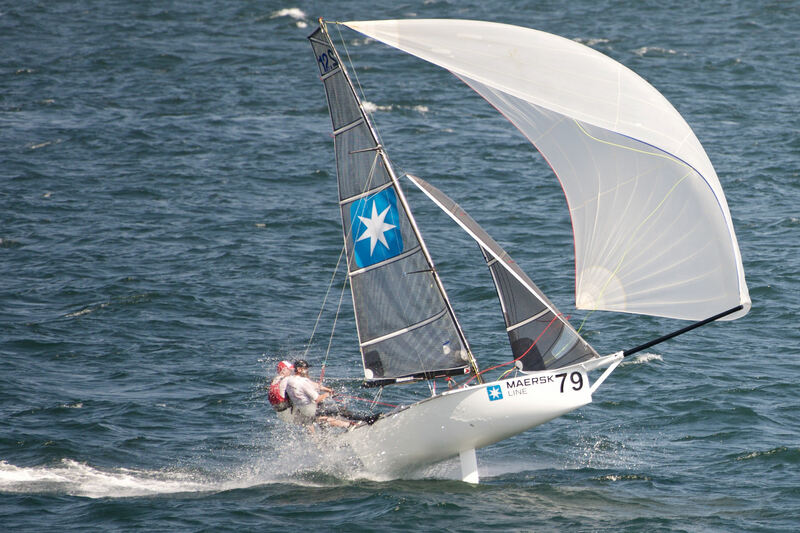 The regatta saw 4 different winners from the 6 races and the regatta only decided on a dramatic final run to the finish, with Sydney Sailmakers (Nicholas Press & Andrew Hay) taking the race win and the championship by the narrowest of margins. 20 Skiffs participate in the regatta with the Sydney Flying Squadron hosting races 1,2 & 3 and Lane Cove 12ft Sailing Skiff Club races 4, 5 & 6. Saturdays race #4 saw the fleet plug in the #1 rigs to contest Lane Cove’s tricky Easter course in around 10-12knots of breeze. The racing was tight throughout the fleet with Sydney Sailmakers and Geotherm (Brett Hobson & Billy Lusty) locked in a tight battle for most of the race with Sydney Sailmakers only extending the lead in the closing stages. LCC (Jonathon Temple & Richard Jones) showed good speed with their new #1 rig to grab 2nd spot from Geotherm on the perilous leg through humbug to the finish! Term and Conditions (Brad Phillips & Tim Barraclough) has another strong showing in 4th to follow up their race #2 victory, definitely a skiff to watch at the upcoming Interdominion Contest. Sundays race #5 had a gusty 2nd Sail Nor’easter for the skiffs to deal with. The pressure was on with only 3 points separating the top 3 Skiffs. Race 5 saw Sydney Sailmakers lead to the top mark once again locked in a tight dual with Geotherm closely followed by Terms & Conditions, LLC, Maersk and Gizmo (James Birdsall & Ewan Duckworth). After rounding the wing mark Sydney Sailmakers hit the drink whilst trying to flog the kite around Clarkes point handing Geotherm a comfortable lead. Both LCC and Terms & Conditions failed to learn from Sydney Sailing makers mistake and followed suit in testing the water temperature. Sydney Sailmakers recovered to finish a distance 2nd with Bigfoot in 3rd and a fast finishing Maersk (Adam Forbes and Alex Johnson) in 4th with Hey Charger (Nick Bernard & Oscar Wilson) in an impressive 5th place. Race #6 and the breeze had built in a solid 2nd sail Bigfoot and Sydney Sailmakers won the start to lead around the top mark with Geotherm right on their hammer. The 3 skiffs crossing tacks and gybes the whole way around the course with lead changes a plenty. Geotherm snuck into the lead at the last bottom mark followed by Sydney Sailmakers then Bigfoot. Geotherm and Sydney Sailmakers embarked on a match race up the final windward leg and allowed Bigfoot to sail around them both and into a narrow lead at the top mark, with only 1 boat length separating the 3 skiffs. 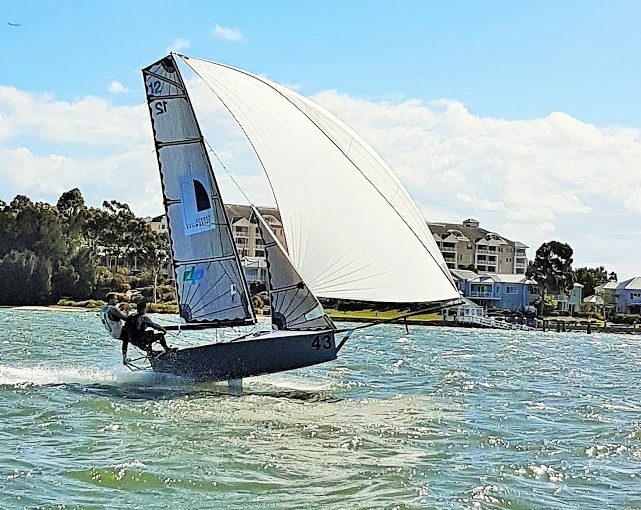 Geotherm held the high lane with Sydney Sailmakers tucked in just below them when a motor boat split the duelling skiffs, which saw Geotherm in the tide after getting an inopportune gust trying to rage over the top the expensive looking power boat. This left Bigfoot (Murray Press & Scott Lanham) and Sydney Sailmakers (Nicholas Press & Andrew Hay) in a gybing dual to the finish with Sydney Sailmakers picking the angle through the line to claim the race win and the Championship. The recently revamped Hey Charger ‘Nick Bernard & Oscar Wilson’ sailed brilliantly to claim the well-deserved Handicap Trophy after a huge winter maintenance and sail-wardrobe upgrade 10 years in the making. The ever-green Murray Press on Bigfoot taking home the veterans trophy and ensuring the battle for the Championship was more than a 2-boat shot out. This entry was posted in News, Race Reports on December 6, 2016 by Skiff-Ed.